Il Corso is a gem of a restaurant, situated in the heart of Midtown Manhattan. If you’d like to know a little more about what to expect, how to dress and where to sit before you arrive, please read on. Reservations are strongly recommended, if not required, and can be made by clicking the “Make a reservation link” above, or by phoning the restaurant directly. Seating at Il Corso is more than comfortable, as chairs are a generous 19 inches wide. Small wrought-iron chairs are provided for guests' pocketbooks while incredibly comfortable armless chairs with golden upholstery framed in richly hued wood are provided for guests themselves. There are also two banquettes in the back room that are upholstered with puckered gold fabric and framed on the top with the same richly hued wood as the chairs. Alternatively, the bar has three backless stools completely upholstered in white leather. 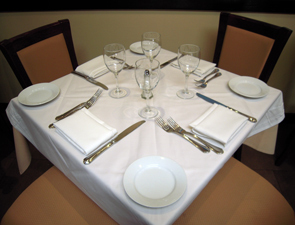 Tables for four are approximately 30 inch square and are generously spaced throughout the restaurant. The atmosphere at Il Corso is completely charming thanks to light music that plays in the background and the vibrant paintings that hang throughout the restaurant. In the front room, the glass doors remain open to the street during the day, providing a cafe-like experience. Meanwhile, the dramatic skylight fills the back room all year long with natural light during the day and an interesting view at night. Servers really care if you’re having a good time and enjoying your cuisine. Our server, Carlos, was exceptional; he was there when we needed him and was always aware of our needs without being intrusive. He was a pure joy! Danilo, the general manager, is generous and welcoming. His gracious attitude adds to the elegant yet convivial atmosphere of Il Corso. Even Chef Andrea Giacomoni makes an appearance to ensure you’re enjoying the meal. Quite simply, this is one of those restaurants that you enjoy so much that you don’t want to tell everyone about, lest it become too popular. But to those in the know -- and there are many -- Il Corso is a wonderful neighborhood gem. Two spacious restrooms have same-level access as the main dining area and are at the back of the restaurant, indicated by plaques painted by Gaetano Franzese, who painted all the artwork in the restaurant. The dress code is casual, but as with any restaurant, use discretion. Situated in what is considered “Midtown West” in Manhattan, Il Corso is easily accessible from any form of transportation, including taxi, subway, bus or car. Paid parking garages are available, as is street parking, and there are even multiple garages on the same block. Subway lines that are near include the F, N, R, W, 4, 5 and 6. Il Corso has won the Wine Spectator Magazine Award of Excellence every year since 2002 and the Wine Spectator Magazine “Best Restaurant for Wine” in 2007.